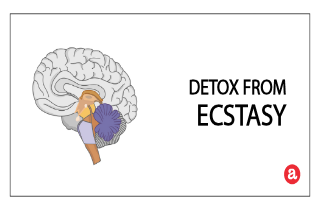 Detox from ecstasy can provoke symptoms such as depression, fatigue, and lack of motivation. How can you detox from ecstasy safely? We review here. Have you or a loved grown accustomed to ecstasy (MDMA)? Have you been taking them on a regular basis or only when partying? In either case, detoxing from ecstasy occurs after use. What is the preferred way to detox from ecstasy? What can be expected during the time when ecstasy is leaving your body? How long does it take to detox and can you withdraw from ecstasy safely? We address these questions here and invite yours at the end. While many people claim that ecstasy is a recreational rather that habit forming drug, research has shown that regular users can and do develop symptoms of psychological dependence to ecstasy 3,4-methylenedioxy-N-methylamphetamine (MDMA), the main ingredient in ecstasy. What’s more, ecstasy abuse may have long term health consequences such as higher risk of cardiovascular diseases, cognitive and mood disorders. Knowing this, how can you stop using ecstasy safely? It is advisable that any case of detox therapy is supervised by a medical professional, especially ifor heavy users. However, it is possible to detox from ecstasy at home as well. What are some of the common therapies used? Generally, individuals undergoing detox from MDMA should keep hydrated. Sometimes doctors would prescribe medications, for instance 2-3 mg/kg Dantrolene sodium, three times a day. This is to help relaxing the muscles and lessening rigidity and body temperature fluctuations. It is also important to note that following the detox phase, periodic health checks and psychological counseling can help individuals who are physiologically dependent on ecstasy to address addiction. During any period of detox, the body eliminates drugs or substances from the central nervous system. After a period of dependence, people can experience withdrawal symptoms as a result of the drug’s absence. While infrequent, ecstasy dependence can occur. And note also that although ecstasy can be detected in the urine for only a short period of time (30 to 48 hours), it takes from 2 to 4 days for the drug toxins to leave the body. People usually in a detox clinic from 3-5 days, but length of stay varies depending how sick they become during the process, their psychological state, and other factors. A person may also stay longer if they are waiting to directly enter a treatment program. Generally, the duration and intensity of ecstasy withdrawal symptoms that can occur during this stage depend a great deal on the level of use, including dosage amounts, frequency and duration of use. Chronic and long term users may need longer than occasional users to recover and may experience more intense symptoms. Some of the above mentioned symptoms may as well occur when ecstasy is taken in conjunction with other drugs for the sake of intensifying its effect. Depending on their intensity, detox from ecstasy symptoms can be treated either at home or under medical surveillance. Inpatient/outpatient surveillance during ecstasy detox usually applies to heavy users, as severe reactions to the drug absence may occur. The goal of detox is to keep people medically stable and safe during the withdrawal, and then assist people to ongoing treatment and recovery. And while it’s possible to detox from ecstasy at home, it is preferred that users seek professional assistance. In fact, you should first consult a medical professional for approval to stay at home during MDMA detox. It is important to keep track of the body temperature during ecstasy detox to avoid drastic fluctuations. It is of utmost importance to stay hydrated as s/he could have lost large amounts of fluid while high on the drug. In cases of any severe withdrawal symptoms, seek medical help immediately. We hope to have addressed your questions about detox from ecstasy here. But if you have any additional questions about detox from ecstasy or would like to share your personal experience, please use the comments section below. We will try to get back to you with a personal and prompt reply. I am a recovering addict from opiates and xanex. I’m 2.5 years off opiates (taking 4-8mg suboxone daily *prescription*) && about a month clean from xanex due to a recent relapse/binge. In that same month, I stopped taking xanex && began using Molly, occasionally. A week later, occasionally became daily. Shortly after, daily became hourly. I do not take large quantities though. On average, I use a half-whole gram throughout the day. Last week, my supplier was out. All week. I believe it was a total of 5 days. Almost immediately I began feeling nauseous. Since then, I have started using again hoping it would go away. I have been back actively using about a gram a day (little bumps about every hour or two). Once I take it, I feel fine. No nausea. But as soon as I start coming down (usually in like a hour/hour && a half) I immediately feel nauseous again. I do not eat because I don’t have an appetite && I’m scared if I make myself eat, I’m going to feel worse. I am in an outpatient program that I attend mon-fri. So, I have the professional help that I need. However, because of my recent relapse with xanex, I will be kicked from the program && will no longer get my suboxone if I take that route. So, I’m trying to do it on my own. The only symptom I experience is nausea. I have spent at least 6 hours reading any && everything the internet has to offer on “home detox from Molly” && I have yet to find ANYTHING “specifically” helpful for curving nausea. Can anyone please help me with absolutely any advice or experience they have in this area. I am 24 years old with twin 18mo old children. I cannot afford to let this continue any longer. I do not want to continue taking it, but I’m completely miserable if I don’t. I have tried one time since I’ve been on suboxone to go cold turkey && it was the WORST withdrawal I have ever dealt with. I’m not ready to come off of it. So I really do not want to ask my doctor for help. Please. Please, if you could help me in absolutely any way at all, it would be beyond greatly appreciated. Hi Annie. Call the number displayed on the website to speak with a trusted treatment consultant to learn more about your treatment options.